A message and photo circulating online warning people of a "building collapse" at Orchard Road is untrue, says Singapore's Building and Construction Authority (BCA). Several Stompers alerted Stomp to the message that was circulating online alleging that a slab had collapsed at a construction site near The Heeren. In the photo accompanying the message, the building that is under construction can be seen sloping on one side. However, according to the BCA, this is part of the building's design. The BCA addressed the circulating messages and photos in a post on their Facebook page on Friday (Aug 3) at about 4.30pm. 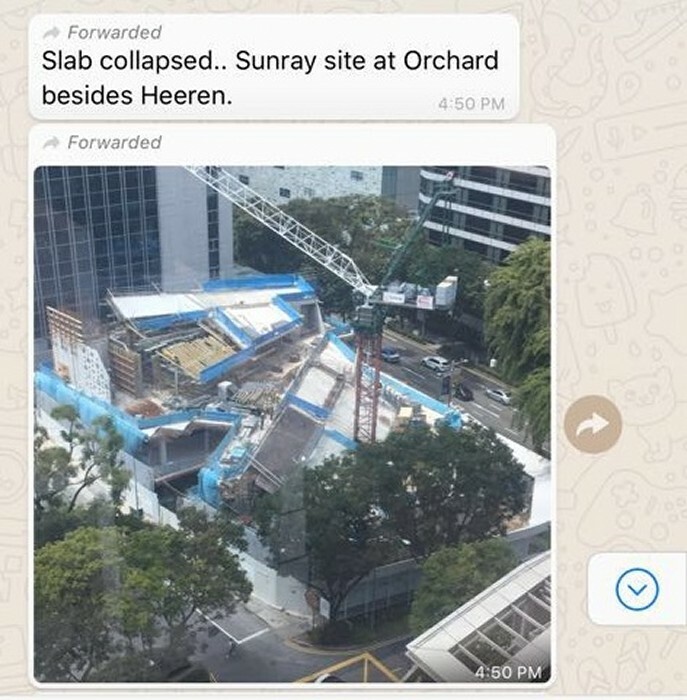 "Some photos have been circulating on the Internet and chat apps about how a building slab has collapsed at a construction site at 250 Orchard Road," it said. "This is untrue; there has been no collapse. "The building has a sloping roof design." It also included a link to a Channel News Asia article on the upcoming Design Orchard building which will focus on local brands and showcase design talent. It is slated for completion in late 2018. The post also featured a photo of a model of the new development featuring its sloping roof design.